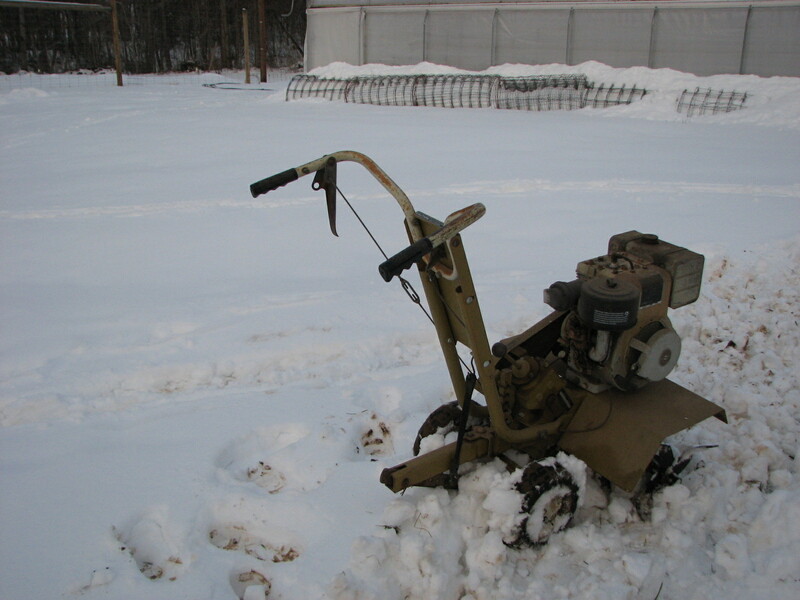 This time last month we were trudging through the snow with the old walk-behind tiller beginning to clean out the tunnels for spring crops. 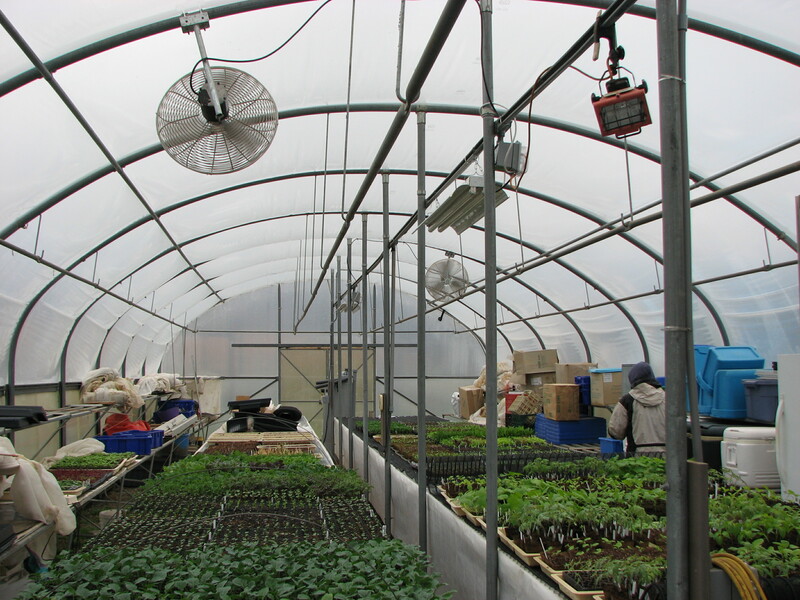 The snow lingered into March keeping us out of the fields, but we have so much going on indoors we manage to keep busy. 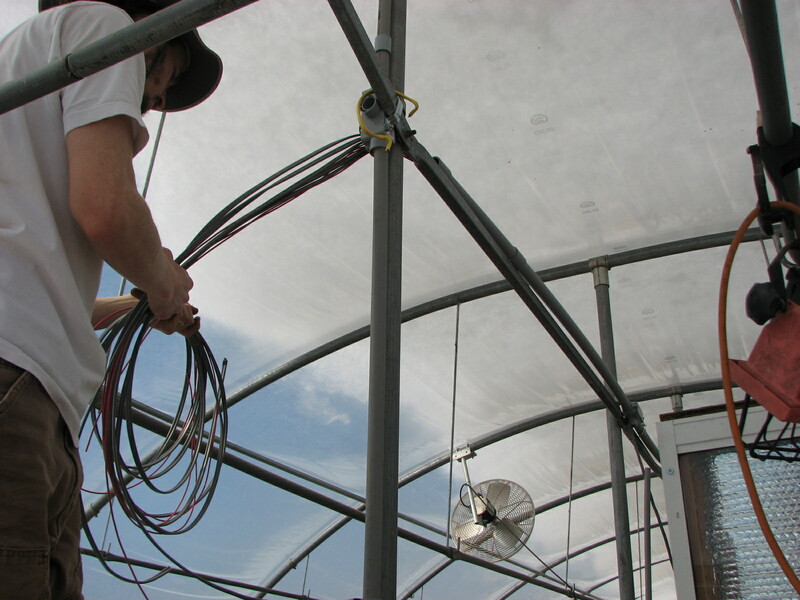 Gavin upgraded the electrical wiring in the potting house. That is a layer of snow on the roof! Now the fans and lights are on switches, we have ample plugs in convenient spots, and wiring is in place for future projects to come into being. The bench heating project has been sidelined as we realized it was going to take a lot more time to assemble and coordinate the installation of a propane tank, etc… also the weather warmed a bit, so keeping the potting house above freezing has been less of a concern. 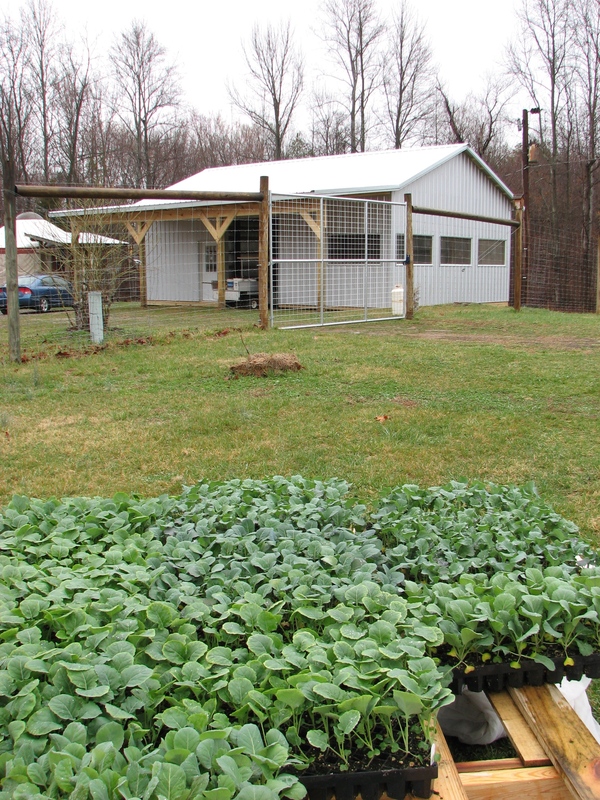 Field prep, planting, and the packing shed project are what’s important at this moment. 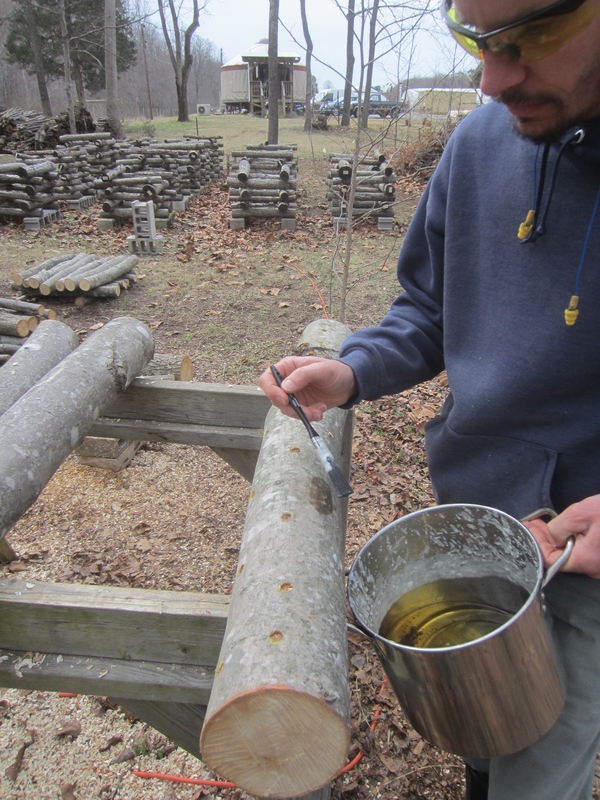 We finished our yearly mushroom log inoculations as the snow melted and fields were still saturated. This year we are trying out oyster mushrooms in addition to the shiitake mushrooms. I think cultivating mushrooms is one of my favorite parts of the farm. Our forest is brimming with these perfect-sized oaks that need thinning, and we hope to improve the health of our wood lot by growing more mushrooms in the future. 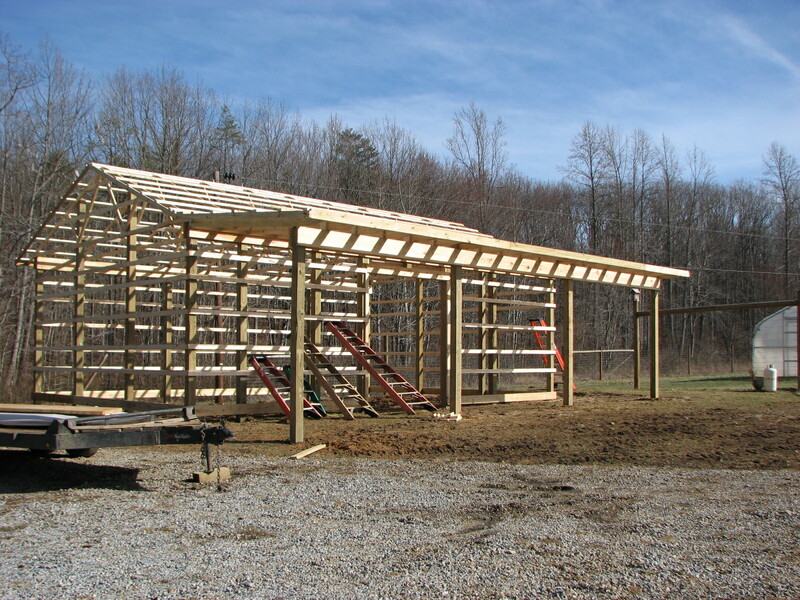 The packing shed project took shape as the weather finally broke. 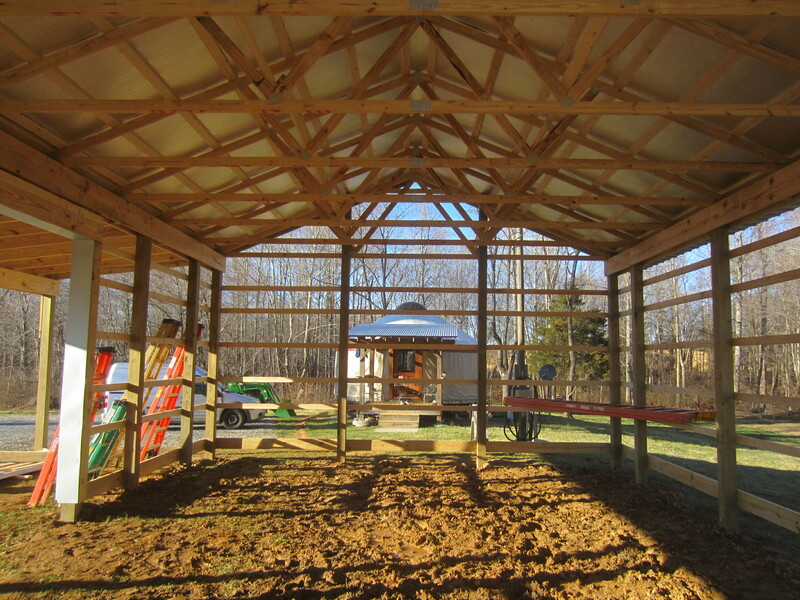 Our builder’s crew did a great job erecting the building shell, and our plumber came last week and did the rough-in plumbing work. Now we will have the concrete floor poured and install the walk-in cooler, as well as complete finish plumbing and electrical work. We’re putting a bathroom in the building, for the convenience of our future employees. 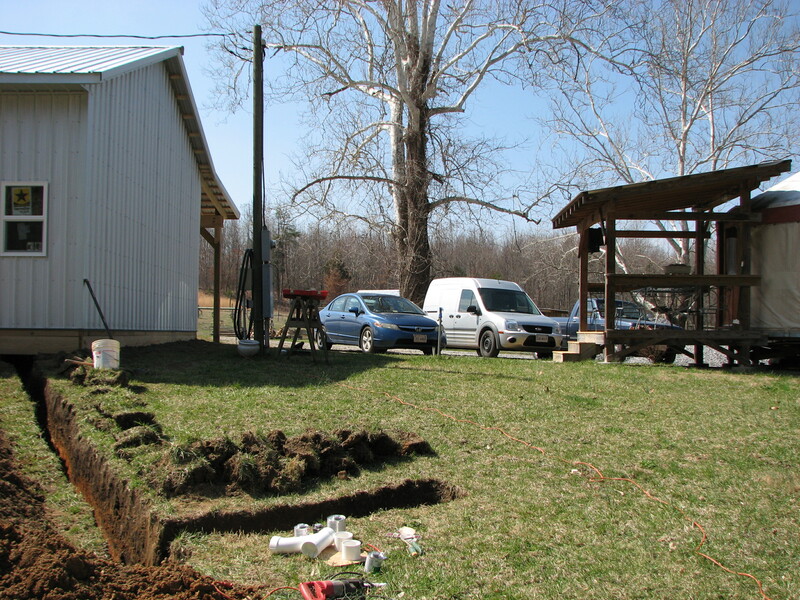 We sited the bathroom to use the sewer line from the trailer (which Gavin dug up and replaced). Lucky for us the septic is approved for 2 bedrooms and the yurt is only 1. That sewer line had not been in use for at least 15 years, but it was interesting to see that the pipe (which was probably installed in the 70s) was not glued together and the walnut tree which we recently cut down had a root growing into the sewer line seeking nutrients. Nature will prevail. We are very pleased with the new building addition, it will really improve our efficiency. We hope to get it functioning before the markets begin! (Yes, I realize this is a lot to ask, as we only have 4 weeks remaining… but I can dream). 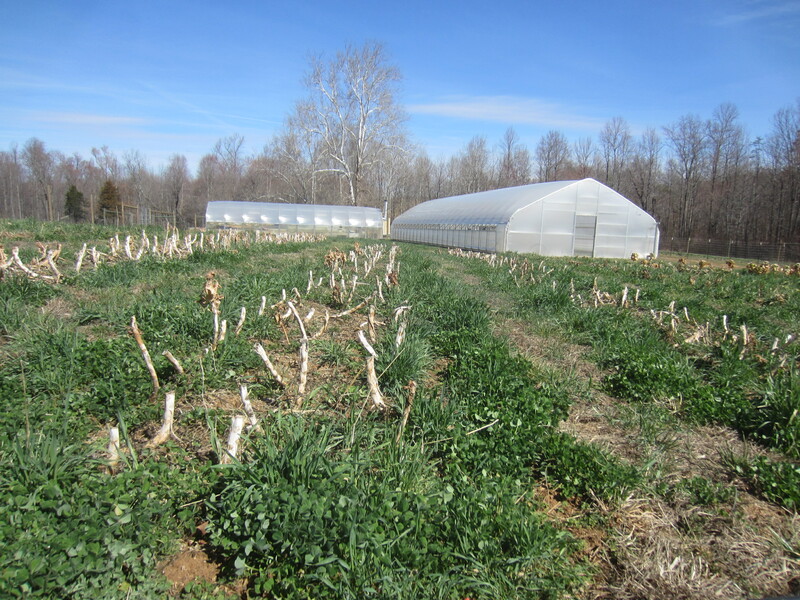 These broccoli plants below are now tucked into their beds in the field. What remains of last fall’s broccoli with rye and clover growing up through. The fields have really greened up in the last week or two. It’s been a major challenge this spring working around the continued wetness in the fields. Our opportunities to work have been limited, but we’ve been knocking out the major prep work and planting tasks as we can. 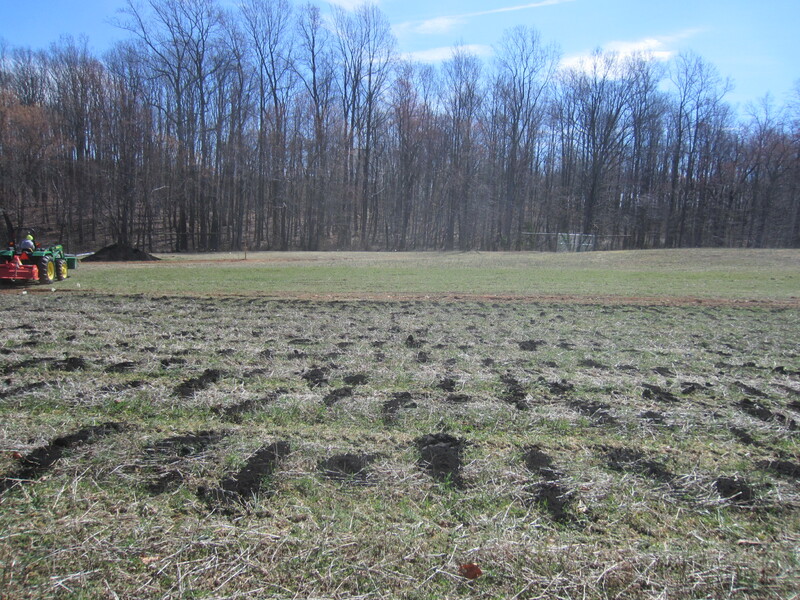 We spread our new field with compost. And managed to sneak a few peas in the ground. As well as some early potatoes. It’s really exciting to see active green growth in the tunnel. 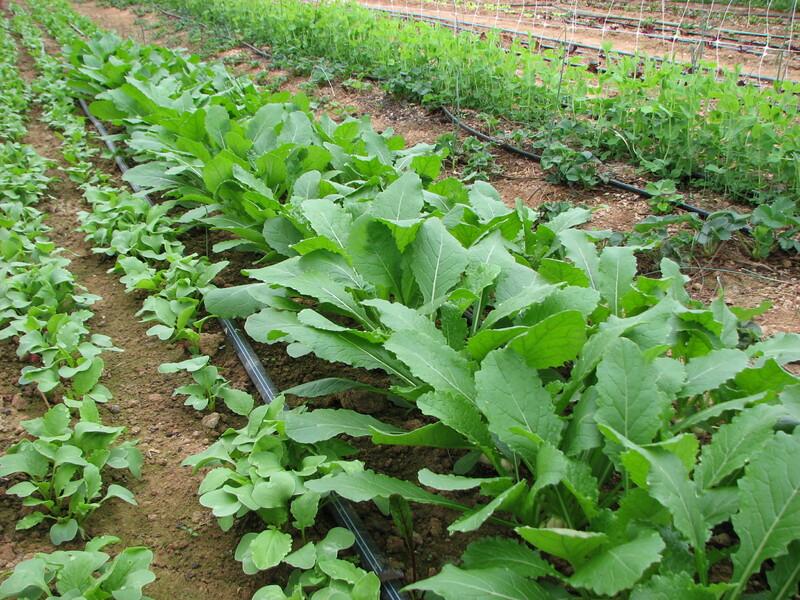 You can almost watch the crops grow a bit each day. Spring is here. 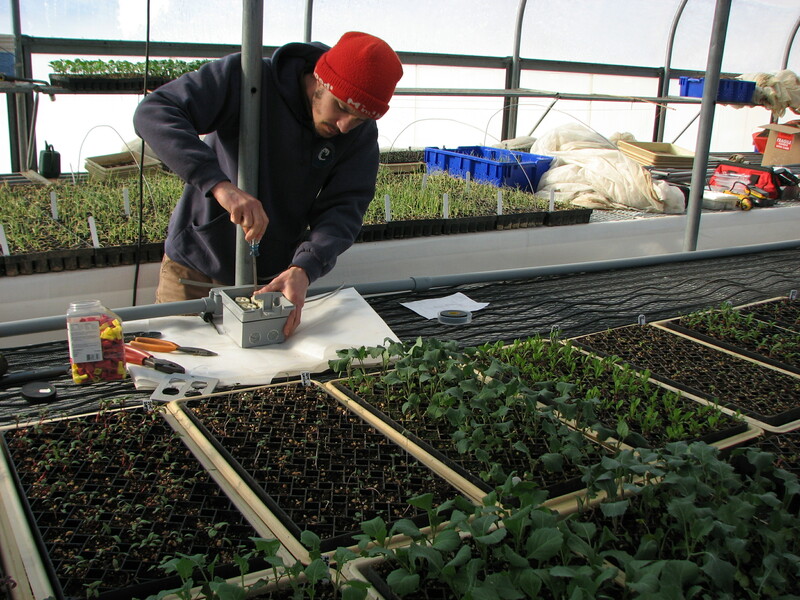 And the potting house is brimming over with spring and summer crops! Each year is so different weather-wise it can be hard to plan… which is frustrating. We try to be patient and flexible, which means continually re-thinking and re-working our plans. 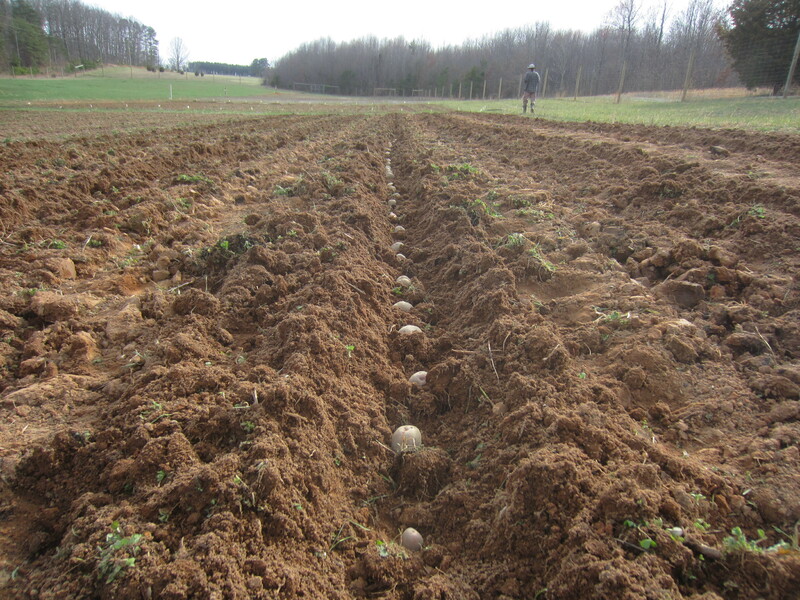 But we keep busy even if our field plantings are delayed by a few weeks, and we know eventually everything will find it’s place in the ground and then onto our plates! Such a lot of work but so much progress. The new building looks so much better than the trailer did for all those years. I can’t wait to see it all myself.